A man left an ex-partner “petrified” after riding past her on a bicycle and saying: “Ha ha, I’m back, you are f--king dead”. On Thursday Gareth Hyndman (40), of Bannview Terrace, Portglenone, appeared at Ballymena Magistrates Court via video link from prison, and was given a four months sentence. He was previously convicted after contesting a threat to kill charge relating to the bicycle incident which occurred in Portglenone in April last year. At Thursday’s court, a prosecutor said Hyndman had denied the allegation to police claiming he was not in Portglenone at the time of the offence and that his bicycle was not working after it had previously been involved in a road traffic collision. She said police had no reports of the alleged collision. A defence lawyer said his client was already a sentenced prisoner having been jailed for a year at Antrim County Court on Tuesday May 9. On Tuesday at the County Court, it was heard a member of staff at Kilrea Golf Club was threatened with a crowbar after chasing a burglar - Hyndman - who made off over fields. Hyndman targeted the clubhouse at Lisnagrot Road, Kilrea, on June 13 last year, just weeks after being in court in Belfast for another burglary. In relation to the Kilrea offences the defendant had previously admitted burglary when damage was caused to CCTV, a safe and a wooden cabinet at the club. He had denied charges of assault and going equipped with a crowbar for a burglary but was convicted at a contest and was given a six months jail term. 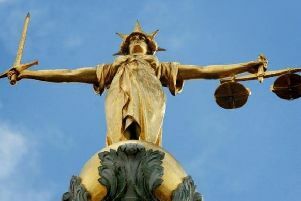 A suspended sentence for previous offences was activated leaving him facing a year in prison. He appealed but at the County Court in Antrim on Tuesday, Judge Gordon Kerr QC told defence barrister Liam McStay he didn’t understand why the judge at the Magistrates Court was “so lenient” as the defendant had 41 theft related convictions. The defence then withdrew the appeal and the original one year sentence was affirmed by the judge. A prosecutor told the County Court that at 5pm on June 13 last year police received a report of a burglary at Kilrea Golf Club. A description was given of a man who had broken into a safe with a crowbar and damaged CCTV before making off on foot towards fields. He was located near Kilrea Primary School throwing items of his clothing over a hedge and he threatened a golf club staff member with a crowbar. At a previous court sitting, a defence lawyer said the assault was “technical” and that no contact had been made with the man. When Hyndman was originally sentenced at Coleraine Magistrates Court in February for the Golf Club burglary Mr McStay said his client had been “branded as a dishonest person and that follows him around”.